Recently, it seems like my devotion to fountain pens is a constant conversation topic. My friend Dayna calls me a fountain pen evangelist, which might be accurate. Old friends who have known me forever see me writing with one and ask or friends who have seen me post about them on facebook ask me if a fountain pen would be right for them (of course it would!). Either way, I thought it was well time that I wrote about why I use fountain pens and why you should too. This quote is one of my favorites. Molly and I both love it and it makes me smile every time. True love is a bouquet of freshly sharpened pencils--or a fountain pen! I was an awkward kid. Looking back, I think it’s a miracle I had friends at all. I was that kid who loved school and saw summer as valuable only if I had new books to read. My favorite time of year was back to school shopping—it was better than Christmas, and the haul was almost always more my style. Seriously, when I was 8 years old and making a wish list for my non-existent American Girl doll and the things I wanted to buy her, I always wanted the school supplies. I also once wrote an entire set of short stories based around my favorite mechanical pencil. This was probably an indication of things to come. What I dreamed of as a child. As an undergrad at the University of Dallas, my mother would send me care packages full of sticky notes, paper clips, tacks, and other supply closet essentials rather than the typical homemade baked goods that other students received. To be honest, I was probably more excited about my care packages than other students were about their cookies (and Mom usually threw some edible treats in, too). Every time I moved from the age of 19 to 26 (15 moves in all), I hauled remnants from these care packages that have filled both my personal desks as well as offices and friends’ desks, too (I’m finally reaching the end of some of that stock). The one thing my mother never bought me was pens, unless I asked for a specific one. There's a reason for this. Because I tend to be a simple kind of girl, it might shock my friends to hear it, but even at the age of 19 I was sort of particular about my pens. My pen pickiness was made more complex by my becoming a calligrapher at a young age. My mother paid for me to take calligraphy classes at the age of 12, which I did for almost two years. As a calligrapher, both handwriting and writing tools became important. For daily writing and classwork, I preferred to use gel pens (although I did dabble with Sharpie pens and other felt tip pens for a while) and I wanted to use the nice gel pens, usually G2s or something similar. I liked having multiple colors at my disposal, so I would buy those big packs of many colors. I sort of became known for my love of nicer pens—it was even a topic for bonding with the (then) assistant director of my graduate program. The main problem with my pen addiction, of course, was that with all the writing I was doing, I would go through my pens quickly. By grad school, I felt like I was going through a couple pens each week. As someone with a passion for the environment, throwing away pens like that felt like a sin, so in the midst of (avoiding) studying for comps, I started looking for a colorful yet ecofriendly writing option. Right away, fountain pens came up. Like most Americans, I knew nothing about fountain pens. In school, we were forced to use pencils almost until high school and at no point were we ever given fountain pens. Apparently in some European countries, fountain pens are an actual part of the educational process—at some point, students graduate from pencil to fountain pen and are taught to write with them. Not here. I was amazed to find that I had, in fact, already used a fountain pen. My father had bought me a pack of Pilot Varsity pens on accident when sent to buy calligraphy pens. I had fallen in love with them, but in the typical mindset of a rural Missourian, had avoided using them for regular usage because they were so special. In addition to those Pilot Varsities, my calligraphy pen that I used for wedding invites (at that point I had done three different weddings, I think) was also a fountain pen. 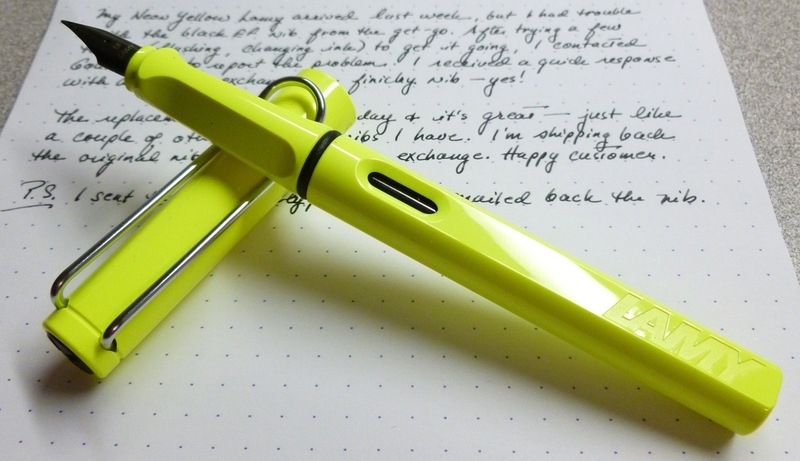 Photo from a review of the Pilot Varsity by No Pen Intended. , written by Brad Dowdy. At that point, I started reading through all his posts, his lists of the best pens, and information about ink. It’s really a wonder I passed comps at all. as my first fountain pen. Because I am an odd duck by all accounts, I decided I wanted to buy the neon yellow one, which incidentally I also believed would keep my boss (who tended to walk away with my favorite pens) from borrowing it because I knew he would think it was a highlighter (this worked until he asked if he could borrow it because he needed a highlighter). I ordered it as a gift for myself when I passed comps. I opened it as soon as written comps were over because I assumed I would pass (I did). I had a very different experience with mine than she did! subscription from Goulet, ink purchases. I’m enjoying what I have, which is a lot of really high quality tools for my craft. In the last year, I have found that my fountain pen addiction is not something that I suffer alone, but rather something that envelopes me in a rather interesting and compassionate community. Online, there is the Pen Addict blog, podcast, other blogs (The Well Appointed Desk, From the Pen Cup, etc. ), and the slack channel involved with the Pen Addict podcast and blog. In Dallas, I have found the Dallas Pen Club, where I get to be the youngest person in the room, but where I hear lots of stories and get to have conversations with wonderful people. Last fall, I attended the Dallas Pen Show and I can’t wait for the next one in September. Of course, I’ve also shared the bug with my mother and my friend Dayna, and I hope to continue to share it. As I said before, I'm a fountain pen evangelist. Hence, I’m writing this. 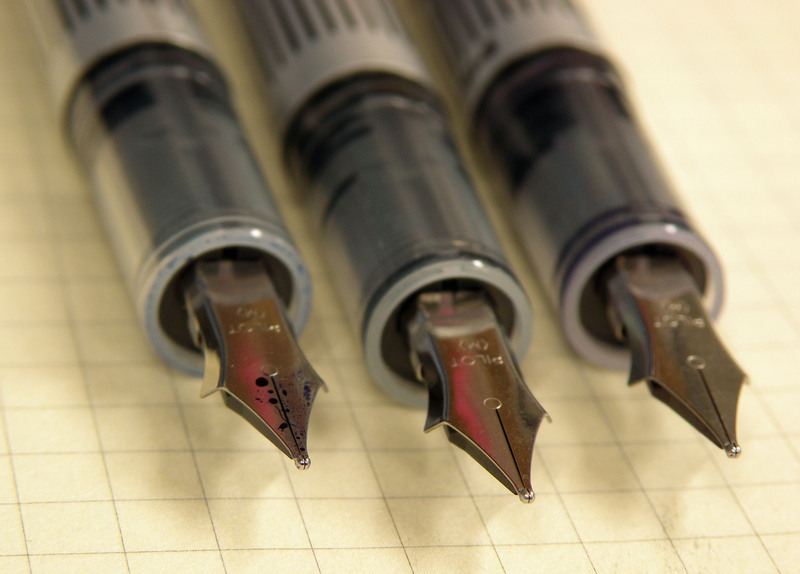 So, why should you use a fountain pen to write with? There have been a number of great articles on this question, so before I go into my reasons, I’ll share them. Seriously, you could go your whole life without throwing away another pen. Certainly, some fountain pen users use cartridges, which are less disposable, but I don’t. I use bottled ink, which is basically trash-free. ). My pen budget might be higher than most people’s pen budgets, but that’s because pens have become a hobby. If you keep it to one or two pens, whatever you need, you’re going to save a lot of money. I saved a lot during that first year of not buying any pens.
. And the best part is that all these things come in a variety of price ranges, so even if you can’t get the dream pen, you can probably get a pen that works well for what you need. Basically, if you can’t find the right fountain pen and ink for you, you probably don’t know how to use the internet. Generally speaking, you won’t lose them.
) scares you because you’re afraid of losing it, let go of that fear. I’ve had plenty of people say that they can’t buy a nice pen because they will lose it or their kids will steal and lose it or whatever. Not true!! Have you ever lost your $100 sunglasses? What about your phone? Laptop? If you make an investment in something, you probably won’t lose it. If you lose pens a lot it’s because you see them as cheap and easily replaceable. I’m a Roman Catholic Classicist English PhD student, so I obviously have a love for tradition. When you write with a fountain pen, you’re writing the same way people did for a long time before our modern writing tools were developed. Even though fountain pens aren’t incredibly old as an actual invention, the nibs and the design are far closer to what people used for centuries than some silly ballpoint. This might seem like an odd thing to consider among reasons to start using a particular type of pen, but I’m serious about the fountain pen community being an attractive reason to start using them. During my transition from being a full time minister to being a PhD student in English at a public university, the fountain pen community made me feel like there was some sort of continuity in my daily life. Reading the blogs, listening to the podcasts, going to the Dallas Pen Show, and having the Dallas Pen Club as a place to get away from both old UD friends and new UNT ones and all the expectations and just be me—this was such an important resource for me. I love it. And, although they weren’t part of my original list, my friend Dayna says I should add that using a fountain pen makes you look more professional and cultured. Also, as a teacher, no student will ever be able to mimic your ink to change their grades and they’re terrified to ask to borrow your pen because fountain pens are apparently scary to 18 year olds. Oh well. What Makes a Good Fountain Pen?